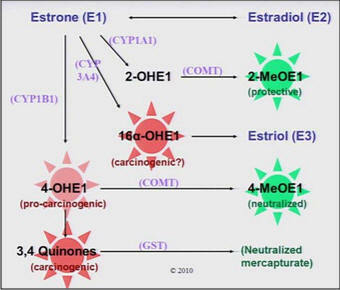 are going to discuss the biochemistry and genetics of estrogen dominance. garlic, beets, and pickled frog skin. simplified into “good” and “bad” forms of estrogen. (higher activity is better) and CYP1B1 (lower activity is better). affect the balance of estrogen metabolites. activity due to polymorphisms, then estrogen dominance is likely. greater extent, restoring a healthy estrogen balance.